Cybercriminals’ interest in IoT devices continues to grow: in H1 2018 we picked up three times as many malware samples attacking smart devices as in the whole of 2017. And in 2017 there were ten times more than in 2016. That doesn’t bode well for the years ahead. 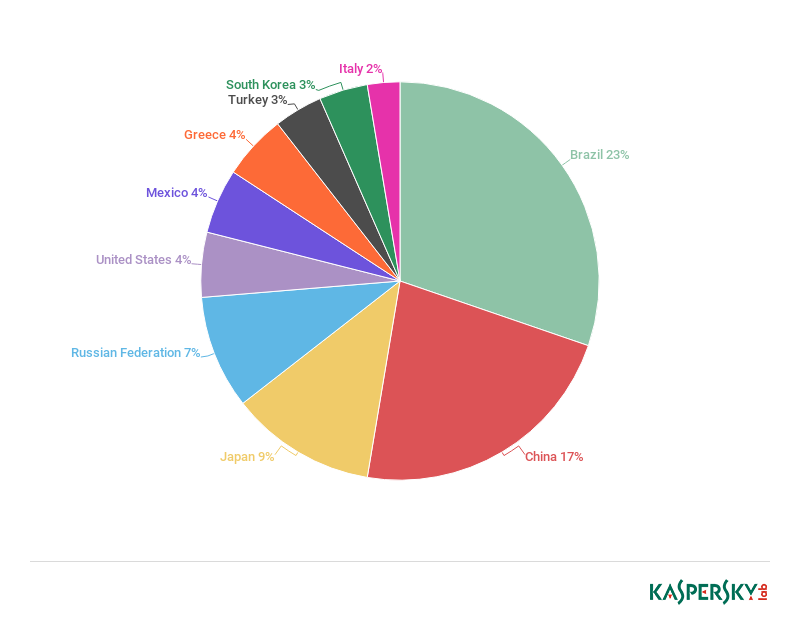 We decided to study what attack vectors are deployed by cybercriminals to infect smart devices, what malware is loaded into the system, and what it means for device owners and victims of freshly armed botnets. One of the most popular attack and infection vectors against devices remains cracking Telnet passwords. In Q2 2018, there were three times as many such attacks against our honeypots than all other types combined. When it came to downloading malware onto IoT devices, cybercriminals’ preferred option was one of the Mirai family (20.9%). As we see, in Q2 2018 the leader by number of unique IP addresses from which Telnet password attacks originated was Brazil (23%). Second place went to China (17%). Russia in our list took 4th place (7%). Overall for the period January 1 – July 2018, our Telnet honeypot registered more than 12 million attacks from 86,560 unique IP addresses, and malware was downloaded from 27,693 unique IP addresses. Since some smart device owners change the default Telnet password to one that is more complex, and many gadgets don’t support this protocol at all, cybercriminals are constantly on the lookout for new ways of infection. This is stimulated by the high competition between virus writers, which has led to password bruteforce attacks becoming less effective: in the event of a successful crack, the device password is changed and access to Telnet is blocked. Although this method is more difficult to implement, it found favor with many virus writers, and it wasn’t long before new Trojans exploiting known vulnerabilities in smart device software started appearing. The vast majority of attacks still come from Telnet and SSH password bruteforcing. The third most common are attacks against the SMB service, which provides remote access to files. We haven’t seen IoT malware attacking this service yet. However, some versions of it contain serious known vulnerabilities such as EternalBlue (Windows) and EternalRed (Linux), which were used, for instance, to distribute the infamous Trojan ransomware WannaCry and the Monero cryptocurrency miner EternalMiner. Attacks against remote device management (TR-069 specification) on port 7547 are highly common. According to Shodan, there are more than 40 million devices in the world with this port open. And that’s despite the vulnerability recently causing the infection of a million Deutsche Telekom routers, not to mention helping to spread the Mirai and Hajime malware families. Another type of attack exploits the Chimay-Red vulnerability in MikroTik routers running under RouterOS versions below 6.38.4. In March 2018, it played an active part in distributing Hajime. IP cameras are also on the cybercriminal radar. In March 2017, several major vulnerabilities were detected in the software of GoAhead devices, and a month after information about it was published, there appeared new versions of the Gafgyt and Persirai Trojans exploiting these vulnerabilities. Just one week after these malicious programs were actively distributed, the number of infected devices climbed to 57,000. On June 8, 2018, a proof-of-concept was published for the CVE-2018-10088 vulnerability in the XionMai uc-httpd web server, used in some Chinese-made smart devices (for example, KKMoon DVRs). The next day, the number of logged attempts to locate devices using this web server more than tripled. The culprit for this spike in activity was the Satori Trojan, known for previously attacking GPON routers. As before, the primary purpose of IoT malware deployment is to perpetrate DDoS attacks. Infected smart devices become part of a botnet that attacks a specific address on command, depriving the host of the ability to correctly handle requests from real users. Such attacks are still deployed by Trojans from the Mirai family and its clones, in particular, Hajime. This is perhaps the least harmful scenario for the end user. The worst (and very unlikely) thing that can happen to the owner of the infected device is being blocked by their ISP. And the device can often by “cured” with a simple reboot. Another type of payload is linked to cryptocurrencies. For instance, IoT malware can install a miner on an infected device. But given the low processing power of smart devices, the feasibility of such attacks remains in doubt, even despite their potentially large number. At the first stage, the attackers try to infect as many routers as possible using known vulnerabilities, in particular: CVE-2014-8361 – RCE in the miniigd SOAP service in Realtek SDK CVE 2017-17215 – RCE in the firmware of Huawei HG532 routers CVE-2018-10561, CVE-2018-10562 – authorization bypass and execution of arbitrary commands on Dasan GPON routers CVE-2018-10088 – buffer overflow in XiongMai uc-httpd 1.0.0 used in the firmware of some routers and other smart devices made by some Chinese manufacturers Using compromised routers and the CVE-2018-1000049 vulnerability in the Claymore Etherium miner remote management tool, they substitute the wallet address for their own. The Trojan’s distribution method is still unknown: its code contains no self-propagation mechanisms. However, we are inclined to believe that it exploits known vulnerabilities in device software for infection purposes. The situation is made worse by the fact that these manufacturers’ devices are used not only in corporate networks, but often as home routers. Smart devices are on the rise, with some forecasts suggesting that by 2020 their number will exceed the world’s population several times over. Yet manufacturers still don’t prioritize security: there are no reminders to change the default password during initial setup or notifications about the release of new firmware versions, and the updating process itself can be complex for the average user. This makes IoT devices a prime target for cybercriminals. Easier to infect than PCs, they often play an important role in the home infrastructure: some manage Internet traffic, others shoot video footage, still others control domestic devices (for example, air conditioning). Malware for smart devices is increasing not only in quantity, but also quality. More and more exploits are being weaponized by cybercriminals, and infected devices are used to steal personal data and mine cryptocurrencies, on top of traditional DDoS attacks. Don’t give access to the device from an external network unless absolutely necessary Periodic rebooting will help get rid of malware already installed (although in most cases the risk of reinfection will remain) Regularly check for new firmware versions and update the device Use complex passwords at least 8 characters long, including upper and lower-case letters, numerals, and special characters Change the factory passwords at initial setup (even if the device does not prompt you to do so) Close/block unused ports, if there is such an option. For example, if you don’t connect to the router via Telnet (port TCP:23), it’s a good idea to disable it so as to close off a potential loophole to intruders. 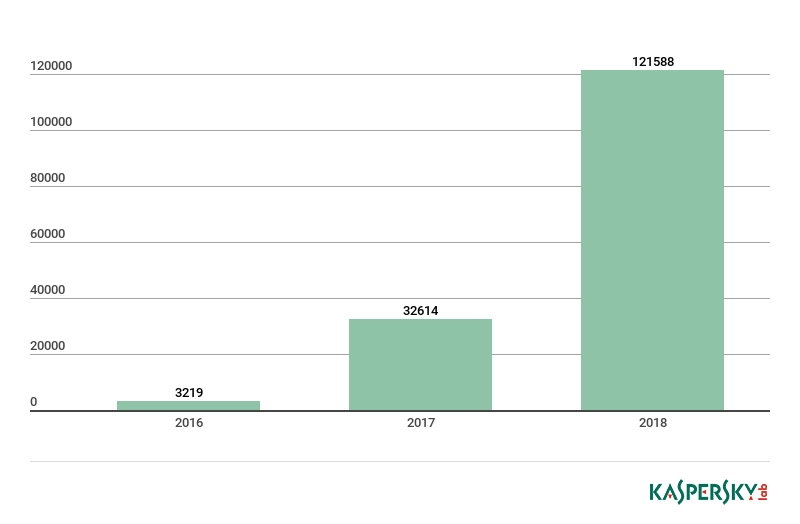 1 — The previous version of the text incorrectly stated that Kaspersky Lab honeypots, used for detecting botnets, were attacked by 33 Miele dishwashers. A Miele representative shared new details with us so we could review our earlier findings. We understand that connection attempts were performed by other objects from the networks that presented the targeted IP-addresses – including, but not limited to, a router or another device within the network. We would like to thank the company for bringing this to our attention and being able to clarify our findings. We apologize for any confusion caused.